Cropped sweater with wide neckline, curved hemline and optional faux fur collar/cuffs. I was inspired by Sue Wilson’s review. 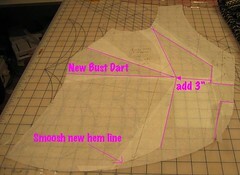 Pattern Sizing:34-46. I made the 46 which might be a size too large for me. I intended on wearing it over other things. Not only does it look just like the photo, but I think I look just like the model! Well, except for the fact that I wear glasses. Ignore the fact that my sweater only has one sleeve. I goobered up the front hem on the serger. That added to the fact that I think the fabric is UGLY helped me to decide not to finish it. I like the overall color, but IRL, the fabric is pretty awful. Yes, but I have issues with putting a knit sleeve in “in the round”. I think it makes much more sense to put it in flat. This may be because I love my serger, but I just don’t think it makes sense to ease in a sleeve that has plenty of stretch. Now, maybe if it didn’t have stretch, I might feel differently. LIKE: I love the neckline and collar. DISLIKE: It’s too short in front for me. I think it looks like it is gaping on me even tho that is the way it is supposed to look. DISLIKE: The way the instructions tell me to put in the sleeve. Click on the image for a more detailed view. 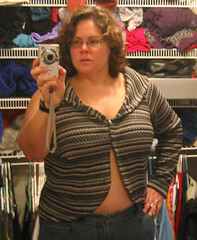 Some sort of man-made fiber sweater knit from Joann’s clearance section. From a distance, I really like the grey color. I think it’s a great color for me, but up close, it’s ugly. It was pretty easy to sew on my serger. I had to use a stabilizer to sew the darts on my sewing machine. My sewing machine sucked the sweater knit down into the feeddogs. Or maybe it was the needle pushed the fabric down into the throat hole. The stabilizer stopped that. As usual, I did a full bust alteration. (Click on image to the left for a larger view) That made the front longer, but not long enough. After I goobered up the front, I decided it wasn’t worth it to put in 2 sleeves and do all the finish details. I would sew the collar again. 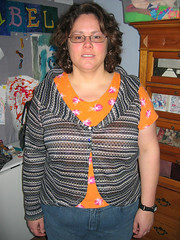 I plan on using the collar on New Look 6898, but I won’t be using the rest of the pattern. I do recommend it, especially if you have a slight figure. Great collar, easy to sew. My dear friend, Gorgeousfabrics has knits on sale for the next few hours. Time for a fabric upgrade!